DDC Dead Prints! We had a big stack of posters that were destined for the recycling bin. Be it dinged corners, misprints, test prints, crinkles, whatever. Paper is delicate. Even the thickest of poster paper. And all these years, there’s been a percentage of the prints that didn’t make the cut. So we kept them in a big pile and the opportunity to give them new life came last November. 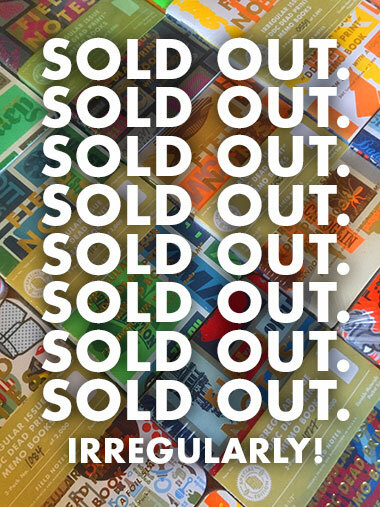 For the opening of our DDC Pop-Up Shop, we unleashed a limited offering of the Irregular Issue “DDC Dead Print” 3-pack. That chunk sold for the duration of our pop-up. We kept a stash on ice for the folks who weren’t coming through Portland. Or, in hope of offering a couple sets to everyone who’s down with ALL of our books. Both stuff from the Field Notes mainframe, and, the weirdo stuff that we make in the darkest of corners in Portland. So we’re offering them to you now. Limited to two packs per human! Act now!!! 02. Three books! Irregularly packaged. 03. Think ink on durable papers. 04. Proudly printed in in Portland by our buddy Tyler at Stevens Integrated Services. 05. 3.5” x 5.5” in dimension. 06. 48-page memo books, ready to get weird in. 07. Very, very limited run of these weirdo books. 2,000 3-packs! 08. Plain paper for the innards. 09. Each set is hand-numbered on the belly band, using our patented freehand technique. 10. Limited to two packs per human. 11. We always say it, but here goes again: THESE ARE GONNA GO FAST. Act now!